In July 2018, DINZ announced its jury for the awards: nine convenors of juries to judge the nine main categories and various sub-categories, eight men, one woman. Of the jurors and convenors combined: 46 men, fifteen women. 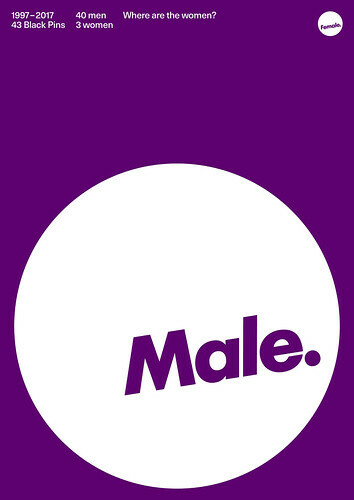 The jury for the Value of Design Award was made up of men only. Over the years, others have encouraged DINZ to address these issues, only to be pushed back. 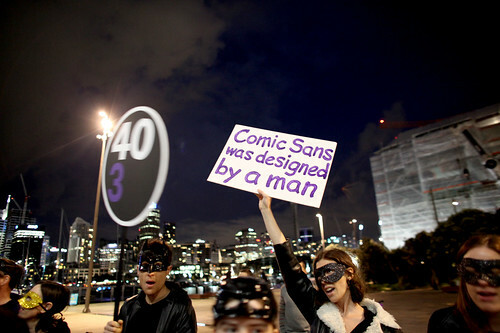 Image from Action 40/3 protest on the evening of the Best Design Awards outside the venue. Photo: Michelle Jones. Top: 1997–2018, 40/3 Black Pins poster, Catherine Griffiths, 2018. At this point, incensed (again), I decided to make protest posters. 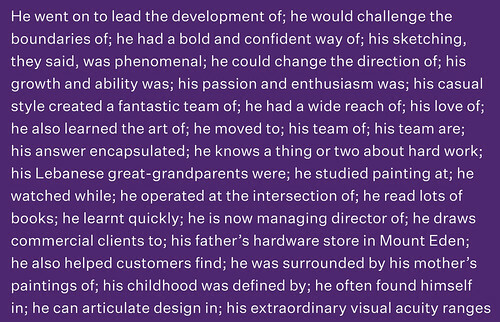 Each used information from the institute’s Best Design Awards website, including their brand typeface Untitled Sans and the spot colour purple. Annotated with details of the typeface used, the posters followed in the vein of my ongoing type / word-play series (see ‘The Brexit Series’). I sent them out into the world via social media and the response was compelling. DINZ’s quick action response to ‘take charge’ of the issue by channelling enquiries back through the institute’s management made it necessary to publicly underline that this was no longer a private matter. We also recommended that the institute engage an independent and professional audit to review the structures and processes. The Spinoff, a New Zealand online news outlet, had me write about the posters, and our reach went nationwide. The Alphabettes published it on their site, and next thing it was international, a modest wildfire. Where are the women?, Bryn Fenemor, 2018. The Thursday following the poster protest, DINZ had its AGM. In a hurried change to agenda, the issues were tabled. Graphic designer and letterer Sarah Maxey was announced as a 2018 Fellow, and later shared her tally of the DINZ membership: 1086 total, of whom 499 are women, just under half. Her accolade updated the Fellows (there’s a label!) to 52 men, nine women. Another poster? We launched Designers Speak (Up) to provide a channel for both written and designed thought (the name is a play on Designers Speak, a series of lunchtime talks I’d organised in 2005). We initiated the Directory of Women Designers for Aotearoa New Zealand. Aotearoa is the Māori name for New Zealand. 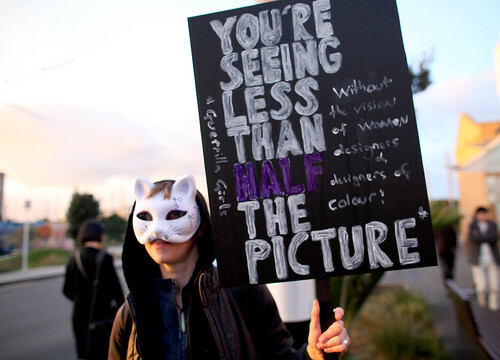 And we organised a protest, Action 40/3, with Auckland Feminist Action, held outside the venue for the Best Design Awards ceremony – whose date coincided with the 125th anniversary of women’s suffrage in the country! That night, the John Britten Black Pin was awarded, one of two Black Pins awarded each year (usually, but not this round), to a male duo, making the score 45 men, three women. 25 Bros in a Row, Ella Sutherland, 2018. Detail of 25 Bros in a Row, Ella Sutherland, 2018. You might well ask who needs DINZ? Who needs the awards? Luke Wood, head of design at the University of Canterbury’s School of Fine Arts says he doesn’t give a hoot about either. But that misses the point. The design industry’s representative body (now claiming to be ‘Building the Best Design Community in the World’) and its award system are set up as gatekeeper. Women have been written out of Aotearoa New Zealand’s design history. Jonty Valentine, head of design at Whitecliffe College of Arts and Design contributed to the Designers Speak (Up) blog with a series of pages from Designscape 38, published in July 1972, showing ‘the faces of design’ a nine-page profile of ‘NZ’s main practising designers’. Of the 64 designers profiled, only five are women, a percentage of 7.8 per cent, very close to the 40/3 ratio of the Best Awards’ Black Pin recipients. The gender imbalance is worse than in 1972. To record the current landscape of women in design and give visibility to the unsung diversity of Aotearoa New Zealand design, Designers Speak (Up) is calling all designers, artists and educators from the Directory of Women Designers (not on? join up!) to design a poster using the medium to explore and address any social, cultural, or political issue of their choice. 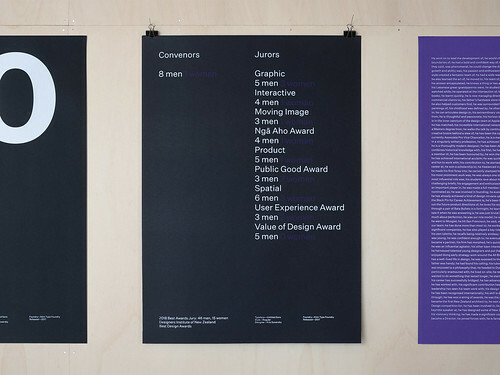 2018 Best Design Awards Jury poster, Catherine Griffiths, 2018. Present Tense : Wahine Toi Aotearoa will present the posters in various forms, from printed to projected to published online over the course of an exhibition at Ramp Gallery in Kirikiriroa / Hamilton. 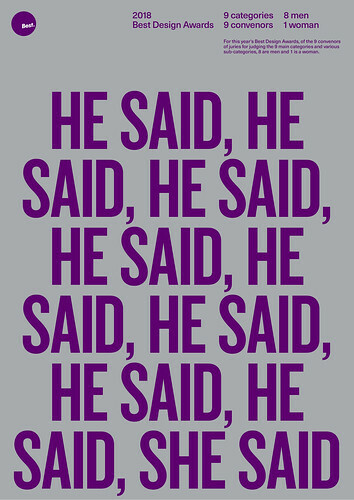 All posters will be collected into the Designers Speak (Up) poster archive. A day of conversation and making – kōrero / kai / mahi – will be part of the programme. A publication will document the project, and include written contributions to offer contextual discussion around the collective and ongoing exhibition as it journeys around the country through 2019. The project is an opportunity to give visibility to all women-identifying designers to be brave and speak up using the poster medium. It’s a space for myriad voices to be heard, supported and championed in the wholehearted, collective way that is the Designers Speak (Up) kaupapa / agenda. 2018 Best Design Awards, 9 categories, 9 convenors, 8 men, 1 woman, Bryn Fenemor, 2018. 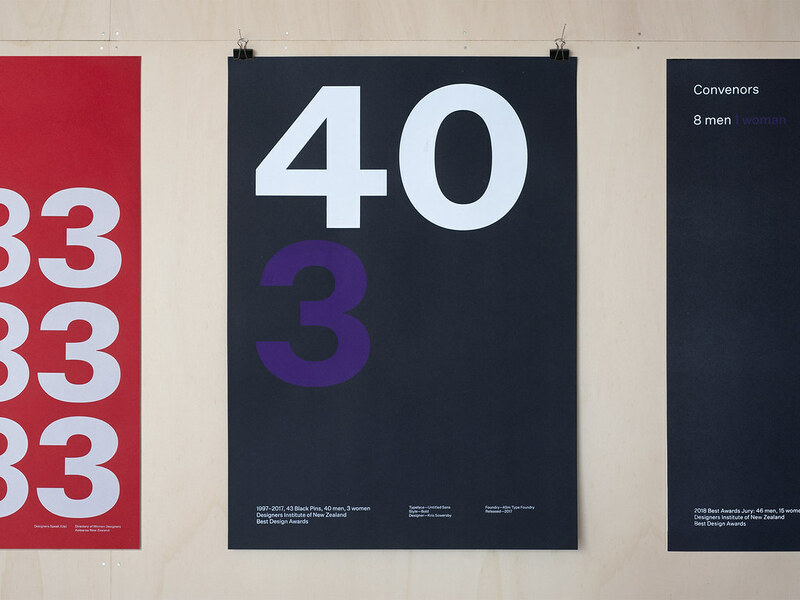 Catherine Griffiths, designer, typographer and educator, Auckland.